Combine 1/2 cup of the salsa and 3/4 cup of the beer in a medium mixing bowl and mix until well blended. 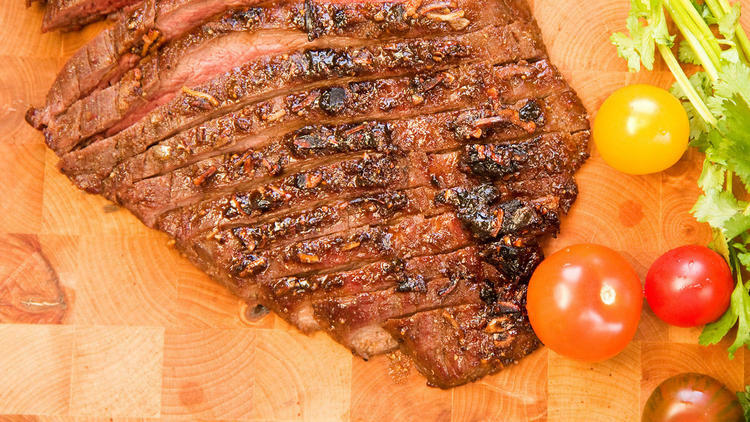 Flatten out the flank steak in a shallow, large nonaluminum dish. Pour the marinade over it and marinate for 2 to 24 hours covered in the refrigerator; the longer, the more tender. In a small serving bowl, combine the remaining salsa and beer for the sauce and mix together. Taste for seasoning. Prepare a barbecue for medium-heat grilling. Remove the steak from the marinade and grill it 3 inches from the heat for 5 to 7 minutes on each side for a medium-rare. Place on a carving platter and let rest for 5 minutes. Thinly slice against the grain. Serve immediately with the sauce. Recipe can be prepared up to 1 day ahead through step 2 and refrigerated. Prepare a barbecue for medium-high-heat grilling. Grill the tomatoes, onion slices and scallions until partially charred, turning occasionally. The red onions will take the longest. Transfer to a plate. Grill the cilantro for about 30 seconds, just to wilt and give off a slight smoky flavor. With the motor running, add the garlic cloves to a food processor fitted with the metal blade. Process until pureed. Add the grilled vegetables and remaining ingredients and process until all the vegetables are pureed. Taste for seasoning. (For a thinner consistency, add more chicken stock.) Serve with chips and guacamole or as a condiment for grilled chicken or meat. Recipe can be prepared up to one week ahead, covered tightly and refrigerated.